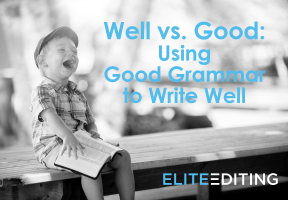 In today’s world of texting and internet messaging, it’s easy to sacrifice quality writing and proper grammar for speed. As long as the person reading your message understands what you’re saying, it doesn’t matter if your sentences aren’t exactly correct, right? But when those poor grammar habits start to appear in your formal writing, it’s time to slow down and learn the rules so you can make your professional writing as good as possible. 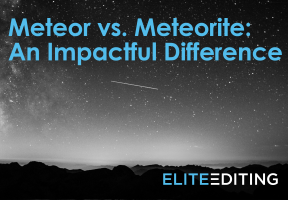 A common error we at Elite Editing see in people’s writing is the comma splice. But what is a comma splice? That’s exactly the question we’ll address in this post. 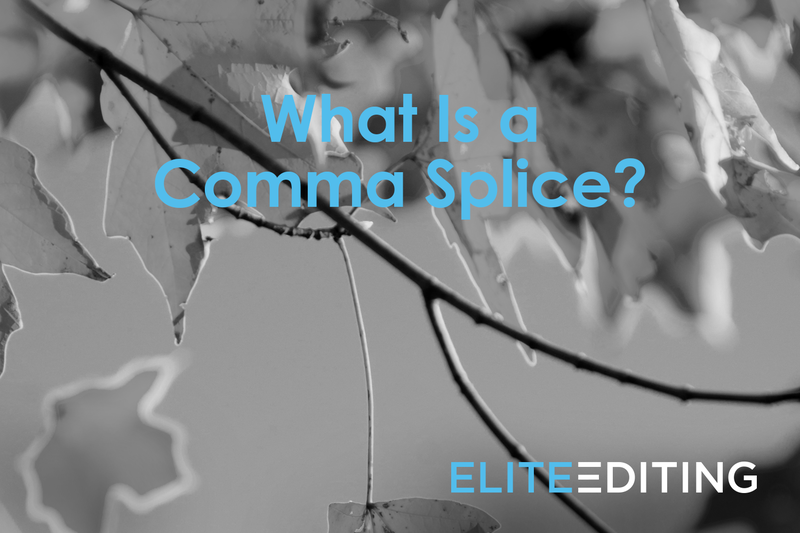 In addition to providing the definition of a comma splice, we’ll also cover several examples of comma splices and suggestions for how to fix them. 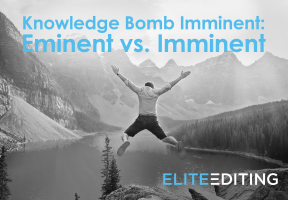 We’ll even go through some comma splice exercises so you can put your new knowledge into action. A comma splice occurs when two independent clauses are joined only by a comma, which is incorrect. Why is it called a splice? To splice means to connect two objects (such as wooden boards or strands of yarn or pieces of wire) by joining them at their ends. In writing, the two objects being connected are two independent clauses, and a comma incorrectly splices them together. But wait—what exactly is an independent clause? The sky grew overcast, it started to rain. These are two distinct sentences express two separate—although related—thoughts, and a comma isn’t enough to connect them while also delineating one from the other. Comma splices, sometimes called comma faults, are easy to use accidentally because they can imitate the way people speak. However, using them in your writing can make it seem low quality and nonprofessional, so learning how to avoid comma splices will improve your writing style. I don’t really like small towns, I like cities. My friend bought new slippers, his cat tore them up. She doesn’t want cake, she wants ice cream. I’m learning about comma splices, they are confusing. The leaves are starting to fall, it’s not autumn yet. Now that the comma splice definition is clear, let’s learn some options for how to fix a comma splice. Fortunately, there are several ways to fix a comma splice if you find one in your writing; which option you use depends on the sentence, but a good way to decide is by determining how closely the independent clauses relate to each other. When you’re deciding how to fix a comma splice, don’t forget that you don’t have to join the two independent clauses into a single sentence; if making them two separate sentences won’t weaken the connection between them, you can divide them into two sentences with a period. I don’t really like small towns. I like cities. My friend bought new slippers; his cat tore them up. An em dash is commonly used to set off parenthetical information, but it’s also a good replacement for a comma splice when you want to add emphasis to the second independent clause. 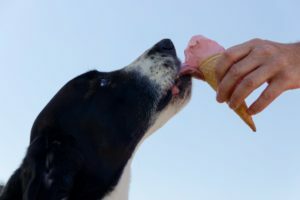 She doesn’t want cake—she wants ice cream. Though it doesn’t work in all cases, a colon can also fix a comma fault. Just remember that what a colon does is signify an explanation, expansion, or result of what comes before it, so a colon is only appropriate when the second independent clause amplifies or explains the first. I’m learning about comma splices: they are confusing. The leaves are starting to fall, but it isn’t autumn yet. The door is locked; I can’t get in. Vanilla is good, chocolate is better. I’m out of clean socks, but there’s no more laundry soap. Don’t set that so far away, bring it to me. I love grammar, it’s my best subject. Think you found them all? Check your answers against the answer key at the end of this post! We’ve spent a lot of time studying comma splice examples so we can learn how to fix comma splices, but is there ever a time when you should use a comma splice? Though accidentally using a comma splice is a sign of poor writing, some famous writers and individuals have used comma splices intentionally to great effect. For example, you’ve probably heard this legendary line by Julius Caesar: “I came, I saw, I conquered.” As you now know, this sentence is three independent clauses joined with commas, but you’ll probably agree that it’s a much more powerful sentence with the comma splices than it would be if the comma faults were corrected. So, while it’s important to know the comma splice definition and how to avoid comma splices, this is one of those “Learn the rule so you know when to break it” situations. If comma faults appear in your writing, make sure they’re intentional. I just learned about comma splices, I’m now an expert at fixing them. Comma splice quiz answer key: Items 2, 4, and 5 contain comma splices.